US Coast Guard Auxiliary Mascot "Coastie"
February 6, 2019. Would you like to try maneuvering a Boston Whaler on the water without any chance of shipwrecking? Then, visit the new-look Boating Information Center at the February 14-17, 2019 Central NY Boat Show at the New York State Fairgrounds in Syracuse, N.Y.
New York Sea Grant has partnered with the U.S. Coast Guard Auxiliary and Coast Guard Reserve, New York State Parks Marine Services Bureau, and America’s Boating Club: U.S. Power Squadron Syracuse Chapter to present the new exhibit at the boat show.
. volunteer opportunities with boating organizations. Show hours are 1-9 pm on Thursday, February 14th and Friday, February 15th; 10 am-9 pm on Saturday, February 16th; and 10 am-5 pm on Sunday, February 17th. Show admission is $10 per person, 13 and younger free. Free parking and shuttle are provided. 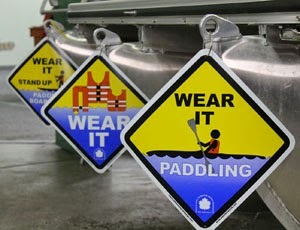 Learn more at www.cnyboatshow.com. To learn more about New York Sea Grant, a National Oceanic and Atmospheric Administration cooperative program of Cornell University and the State University of New York, visit nyseagrant.org; U.S. Coast Guard Auxiliary Flotilla 21: www.facebook.com/Flotilla21UsCoastGuardAuxiliarySyracuseNy/; America’s Boating Club: U.S. Power Squadron: https://www.usps.org/index.php/sss-home; NYS Parks Marine Services Bureau: https://parks.ny.gov/recreation/boating/education.aspx. 1 Comment to "Try Boating Simulator, Meet "Coastie" at Feb 14-17 Boat Show"